Take ThoughtOffice for a Test Drive. This fully functional 15-day trial version will help you develop lots of new ideas, and drill-down on problems, revealing opportunities that traditional “linear” thinking can miss. 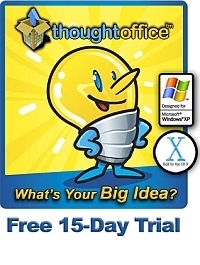 Wondering how ThoughtOffice can work for you? Get a taste of each ExpertTopic module by downloading a free Demo Session. These are brainstorming sessions developed with questions and comments from 4 of the 16 ExpertTopic Modules and lateral thinking responses from the IdeaBrowser. Each Session provides a short overview of the content in each eXpertTopic module, including sample questions from each major category. Simply download and unzip the Demo Sessions to your hard drive. Then, start ThoughtOffice, and click File => Open to select the Demo Session (exs file) you want to view.